The new policy allows Spotify to track your location, collect your photos and thumb through your contacts. It can view your Facebook posts and share some of the information it collects with advertisers. The giant streaming music service, which has 75 million subscribers, says there's a reasonable explanation for all of this. In a blog post titled "Sorry," Spotify CEO Daniel Ek acknowledged that the new policy "caused a lot of confusion about what kind of information we access and what we do with it." "We apologize for that," Ek said. Spotify said the data it can now access helps it to "tailor improved experiences" to customers and build "new personalized products for the future." Among the new features that Spotify pointed to is Spotify Running, which uses GPS to measure how fast you're running. 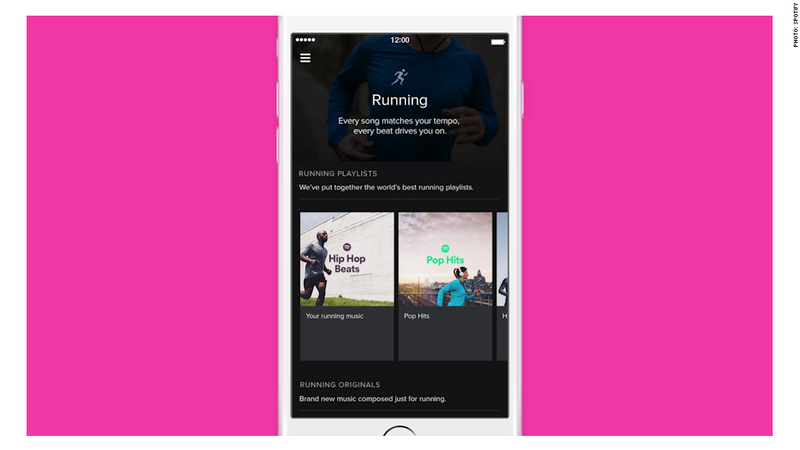 The Spotify Running app matches the beats per minute of songs it chooses to play to the pace of your run. Spotify also noted that its new Discover Weekly feature curates a weekly playlist based on your tastes. The music service uses information on your smartphone to infer your musical preferences. "If you don't want to share this kind of information, you don't have to," Ek said. "We will ask for your express permission before accessing any of this data -- and we will only use it for specific purposes that will allow you to customize your Spotify experience." "With your permission, we may collect information stored on your mobile device, such as contacts, photos, or media files," the policy says. "We may also collect information about your location based on, for example, your phone's GPS location or other forms of locating mobile devices (e.g., Bluetooth). We may also collect sensor data (e.g., data about the speed of your movements, such as whether you are running, walking, or in transit)." When you connect to Facebook, Spotify says it can collect and store information you post to Facebook (FB), including, "your username ... and other information that may be available on or through your Facebook account, including your name, profile picture, country, hometown, e-mail address, date of birth, gender, friends' names and profile pictures and networks." Spotify says it can use that information to share with third parties, though Ek noted that is "de-identified," so you're anonymous to advertisers. If you don't want to accept the terms of service, there's not a whole lot that can be done. You can disable some sharing of your data by by clicking on "edit profile," in the Spotify app's setting tab and unchecking a box that says "Yes, share my information with third parties." But if you don't want Spotify to go through your phone or track your location -- even with your permission -- your only real option is to stop using Spotify and delete your account.